Who was your favorite Hobbit? Hobbit of the Shire (b. T.A. 22 September 2968 - ?? ). Son of Drogo Baggins and Primula Brandybuck. Cousin and adopted heir of Bilbo Baggins. Member of the Company of the Ring. Bearer of the One Ring. Mayor of Michel Delving. Frodo Baggins, one of the most renowned personalities in the history of Middle-Earth, successfully carried the One Ring of Sauron from Hobbiton in the Shire to Mount Doom in Mordor where he was at last overcome by the power of the Ring but saved from its evil by Gollum who took it from him and inadvertantly destroyed it and himself. Frodo�s efforts resulted in the destruction of Sauron and the establishment of the Reunited Kingdom of Gondor and Arnor. Frodo Baggins was the son of Drogo and Primula Baggins. He lived together with his parents in the family home of his mother, Brandy Hall in Buckland, until Drogo and Primula were drowned in a boating accident when Frodo was just 12 years old. The young hobbit was left as an orphan among his Brandybuck relatives. In Buckland, Frodo grew into a fine young hobbit, only occasionally getting into mischief while stealing mushrooms from old Farmer Maggot and once even entering the Old Forest. He had many friends and was especially well-liked by his elder cousin, Bilbo Baggins who was also an orphan. When Frodo was 22 years old, Bilbo invited him to come live with him at Bag End in Hobbiton, adopting him as his heir. By coincidence, the two hobbits shared the same birthday, 22 September, and made it a custom to celebrate each year with a small party. When Bilbo was turning 111 and Frodo 33 (a very important year for hobbits), they threw a huge Party and invited practically everyone they knew. On 22 September 3001, the famous Farewell Party was given, so called because Bilbo disappeared while giving a speech and departed the Shire never to be seen there again. This left Frodo as the master of Bag End. The wizard explained that Sauron the Dark Lord had long ago created the One Ring to control the peoples of Middle-Earth. But the Ring had been wrested from him in battle and later lost. It had laid for centuries at the bottom of the Anduin river until it came into the possession of a small creatured named Gollum. Gollum took the Ring and hid himself away deep under the Misty Mountains. After many years, seemingly by accident, Bilbo Baggins found the ring and took it home as a treasure from his journies. Sauron now knew that the Ring had been found again and was looking for it. Gandalf refused it when Frodo offered to allow the wizard to take the Ring for safekeeping. 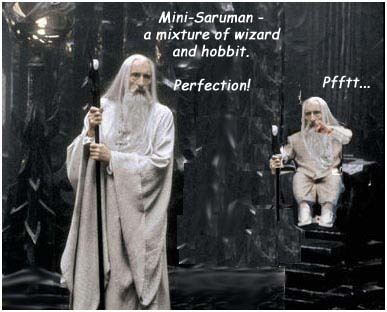 Gandalf did not want to risk the temptation of using the power the Ring possessed. Instead, he recommended that Frodo take the Ring and leave the Shire as soon as possible. To protect the hobbits of his land, Frodo agreed. Gandalf soon left again on important business, leaving Frodo to decide how to quietly leave the Shire. The hobbit invented a ruse of moving back to Buckland, even selling Bag End to the Sackville-Baggins as part of the deception. He waited through the Summer for Gandalf to return but finally decided that he must begin without the wizard. On 23 September 3018, he and two friends, Samwise Gamgee and Peregrin Took, better known as Sam and Pippin, left Bag End on foot hoping to reach Frodo�s new home at Crickhollow in two or three days. While still in the Shire, they were twice overtaken by Black Riders of Sauron who were searching for the Ring. On both occasions Frodo nearly donned the Ring in a panic reaction to the threat of the Riders, but each time he resisted until the Riders departed. Shortly after the scare of the Black Riders they met Gildor, an Elf who was traveling through the Shire with a company of his folk. Gildor invited the hobbits to send the evening with him and his folk . The next morning the three hobbits traveled cross-country in hopes of avoiding the Black Riders, ending up on the property of Farmer Maggot. Frodo was relieved to find that though Maggot recognized him from his mushroom stealing days, the farmer was actually a very friendly person. The old hobbit invited them in for supper and later drove them to the Buckland Ferry where they met another friend, Meriadoc Brandybuck, better known as Merry. At Crickhollow, Frodo�s friends revealed that they knew of the Ring and his intentions to leave the Shire. They would not allow him to leave without them, so the next morning they left before sunrise, entering the Old Forest in hopes that such a short cut would throw off any pursuit. But the Forest proved to be almost as dangerous as the Riders when the hobbits were caught by Old Man Willow. The evil tree threw Frodo into the Withywindle, trying to hold his head beneath the water. They were only rescued by the timely arrival of Tom Bombadil. Bombadil invited them to his home, proving to be a wise but very strange fellow. During their visit, Frodo allowed Tom to examine the Ring. Astonishingly, he did not vanish when he wore it. After Tom returned the Ring to him, Frodo put it on as a test to ensure Tom had returned the same ring he had borrowed. This was the first time that Frodo wore the Ring. After leaving Tom, the hobbits were captured by a barrow-wight on the Barrow-Downs. The spirit entombed them all, apparently seeking to slay them, but Frodo awoke and fought the wight, calling for Tom as he did so. Bombadil appeared and freed them, giving them swords from the treasure of the Barrow. Relieved to still be alive, they rushed on to the nearby town of Bree where Frodo used the alias �Underhill� to disguise his true identity. In the Prancing Pony Inn, Frodo foolishly allowed himself too much excitement (and beer) and accidently slipped the Ring onto his finger in front of a crowd of town locals and visitors. This was the second time he wore the Ring. He retired quickly to his roomwhere he spoke with Strider, a friend of Gandalf�s who offered to guide them to the Elven haven of Rivendell. After Barliman Butterber delivered a letter to Frodo from Gandalf that verified Strider�s identity, he agreed to follow the Ranger. Strider led the hobbits safely to Weathertop where Frodo faced five of the Black Rider that had gathered there. The Riders attacked the hobbit and his companions late in the evening by the light of the moon, and Frodo in a panic once again slipped the Ring on his finger. The Ring allowed him to see clearly into the ghost-realm of the Riders, and their Lord rushed the hobbit, stabbing him in the shoulder with his cursed knife. Frodo dropped into unconsciousness and was saved only by the daring of Strider who rushed the Riders regardless of his own safety. Frodo woke soon after the attack to find the Riders and Strider gone. Sam began to doubt him, but the Ranger soon returned and staunched Frodo�s wound with leaves of athelas which he had found in the wild. The treatment lessened the pain in Frodo�s shoulder enough for them to continue on. Frodo�s wound ached more and more as they traveled for the next two weeks through the trackless wastes between Weathertop and Rivendell. Finally, just as the pain was overcoming him, they met Glorfindel, an Elf-Lord of Rivendell sent to find them and aid their journey. Glorfindel inspected Frodo�s wound but could do little but ease the pain. The Elf set the ill hobbit on his horse as a precaution should the Black Riders appear. Just as they reached the Ford of Bruinen they were overtaken by all nine of the Black Riders. With the aid of Glorfindel�s horse Frodo escaped the wraiths, commanding them to return to Mordor, but he swooned at the last, unable to hold himself up any longer through the anguish caused by the wound he had received on Weathertop. His barrow-sword broken in his grasp and he fell to the ground. Frodo awoke in Rivendell to find Gandalf at his side. He had lain for four days while Elrond had striven to heal the wound he had received. Strength soon returned to him and he climbed out of bed to accompany his friends to a great feast. There he talked long with Gl�in the Dwarf and was later reunited with Bilbo. The next day he was summoned to the Council of Elrond where it was explained that the Ring must be taken to the Cracks of Doom in the Mountain of Fire in Mordor where it had first been forged. Only there could the Ring be destroyed. Frodo, showing incredible bravery and understanding, volunteered to be the one to take the Ring to Mount Doom. So it was decided, and eight companions were chosen to assist Frodo on his journey: Gandalf, Aragorn, Boromir, Legoas, Gimli, Sam, Pippin and Merry. After two months of preparation and rest they set out on the 25th of December. But before they left, Bilbo gave Frodo his sword, Sting, and his mithril corslet. At the old hobbit�s request, he kept the dwarf armor a secret from his companions. Frodo was nearly overcome by cold when the Comany of the Ring attempted to cross the Redhorn Gate. And when they came to the West Gate of Moria a recurring phenomenon began to occur where Frodo was always targeted by his enemies. The first occurance of this was when the Watcher in the Water singled him out, trying to drag him in the water. Many more similar events were to come. Once in the dwarven mines, Frodo was nearly killed by a spear thrown by a great orc. Bilbo�s mithril coat saved his life, but he recieved a terrible bruise where the spear had hit his side. In that same battle, Frodo used Sting to severely wound the foot of a troll. While still in Moria Frodo again seemed almost magnetic when an arrow struck him as he ran to cross the Bridge of Khazad-d�m. His armor saved him again and the arrow bounced away harmlessly. The Company hurried to temporary safety in the Lothl�rien, and there Frodo and his friends mourned the loss of Gandalf. Galadriel showed him her Mirror and he was nearly caught by the Eye of Sauron when he risked a look at its mirrored surface. But rather than discouraging him, the image in the Mirror only strengthened Frodo�s resolve to continue his Quest. As he left the Golden Wood he recieved the Phial of Galadriel as a departing gift. Once on the Anduin, Frodo rode with Sam and Aragorn. Gollum, who had been trailing them since Moria, nearly grabbed Frodo but was scared off by Sam. An arrow found Frodo in the darkness during a sudden attack by orcs on the east bank of the river. Again, he seemed to draw fire and again his armor saved him. At Parth Galen, Boromir counseled that they should proceed to Minas Tirith, but Frodo desired to continue on to Mordor. He climbed the slopes of Amen Hen seeking solitude to aid his decision-making process. But Boromir followed him and after a short argument demanded that Frodo relinquish the Ring to him. Frodo refused and Boromir attacked him. Only by donning the Ring and running off invisibly was he able to escape. Once safely away from Boromir, Frodo walked through the woods, still unsure of his course. His wandering brought him to the Seat of Seeing, which he sat upon. From the Seat he saw the movements of many armies in all direction, war was coming throughout the land. Because he still wore the Ring, he attracted the roving Eye of Sauron in Barad-d�r. He jumped from the seat, but still the Eye�s gaze drew closer. But then Gandalf, far away and new-returned to Middle-Earth, talked to him in his mind, commanding him to remove the Ring. Though he did not recognize the Voice as Gandalf, Frodo took the Ring off. Free of the scrutiny of the Eye, he made up his mind. To spare his companions the certain terrors of a journey into Mordor, he decided to leave without them. He plunged back down the path, donning the Ring for the fifth time, and hurried down to the boats along the river, hoping to slip away unseen. But Sam had guessed at his plan and jumped into the water after Frodo�s boat. Because he could not allow Sam to drown (the faithful hobbit could not swim), Frodo dragged him into the boat, and the hobbits paddled to the eastern bank of the Anduin and marched into the hills of the Emyn Muil. Gollum finally overtook Frodo and Sam as they struggled through the Emyn Muil. The two hobbits wrestled him into submission and Frodo, showing remarkable compassion and understanding of the forces compelling Gollum, made the creature swear an oath of allegiance to him (swearing to the Ring itself). A seemingly reformed Gollum led them out of the hills and into the Dead Marshes, finally taking them within sight of the Black Gate of Mordor. The Gate was closed and heavily protected, but Frodo, seeing no other way, was determined to attempt to enter it. Gollum feared the Ring would be taken if Frodo proceeded to the Black Gate so he suggested another way into the Dark Land. Warily, Frodo agreed to attempt Gollum�s secret way and they crept southwards past the Gate and into Ithilien. In Ithilien Frodo and Sam were captured by Faramir, but Gollum escaped. There they witnessed the battle between the Rangers and the Haradrim. Afterwards Faramir took them to the Henneth Ann�n and Frodo revealed everything to Faramir, including the story of his brother, Boromir. When Gollum discovered the pool near the Ranger�s secret hideout, Frodo begged that his life be spared and vouched for his good behavior. Faramir agreed, but not happily. Leaving Ithilien, they entered the vale of Minas Morgul and climbed the many stairs to Shelob�s Lair. But once inside, Gollum abandonded them and Frodo had to use his Phial and Sting to drive Shelob away. Once free of the Lair, Frodo ran carelessly into the pass and was stung by Shelob in the back of the neck. Her poison caused him to drop into a death-like state and Sam was certain he was dead. The young hobbit took Sting and the Ring and left Frodo�s body lying in the Pass. But Frodo was not dead, and the orcs that came from the Tower of Cirith Ungol to investigate the noise caused by the battle of Sam and Shelob found the hobbit lying by the road. They took up his body and carried it back to the topmost room of the Tower. Frodo was stripped and beaten, kept alive with a vile cordial forced into him. They intended to turn him over to the Nazg�l who were away at the war in Minas Tirith, but instead the orcs fought over Frodo�s mithril coat. Because most of the orcs were killed in the fight, Sam was able to sneak into the tower (with the aid of the Ring) and rescue his friend. Frodo immediately demanded the Ring back, and Sam gave it freely. He Dressed them as orcs and they traveled the road down into the plain of Morgai, surviving on tricklings of water they found and crumbs of lembas that remained to them. Gollum found Frodo again as he and Sam were climbing the slopes of Mount Doom. But again, Frodo spared his life, finally threatening death if Gollum ever laid hands on him again. They then entered the Samamth Naur thinking Gollum gone for good. At the Crack of Doom, the Ring took final possession of Frodo and he refused to throw it into the Fire. Instead, he claimed the Ring as his own, putting it on for a sixth and last time. But Gollum made a final effort to regain his precious by tackling Frodo and biting off the ring finger on the hobbit�s right hand. Gollum took the Ring but in his excitement at having regained that which he had sought so long he fell over the brink and into the Fire. With the Ring destroyed the power of Sauron was shattered and his realm began to disintegrate. Frodo and Sam were carried from the erupting Mount Doom by Gandalf and the Eagles. They were taken to Ithilien where they were reunited with their friends just come from the battle of the Black Gate. Frodo�s elven cloak and mithril corslet, which had been taken from him in the Tower of Critih Ungol, were returned to him at the Field of Cormallen, and Sam gave Sting back to him. Frodo then accompanied the reunited Company of the Ring to Minas Tirith where he served as the crown bearer at Aragorn�s coronoation ceremony. At Midsummer�s Eve he witnessed the marriage of Aragorn and Arwen. But at last, after a time in Gondor, Frodo longed to go home. He and his hobbit companions traveled with Gandalf, Elrond and Galadriel through Rohan and Dunland to Eregion. There, Galadriel and Celeborn took leave of Frodo and crossed over Caradhras to return to L�rien. The hobbits and Gandalf continued on to Rivendell where Frodo and Bilbo celebrated their birthdays. He stayed in Imladris for two week and then took to the road again. From Elrond�s valley the hobbits road unhindered to Bree where they once again stayed at the Prancing Pony. After a short stay there they continued on, but without Gandalf who chose to visit Tom Bombadil rather than return to the Shire. But the hobbits were eager to return to their country and road quickly towards Buckland. In the days that followed, Frodo took a very minor part in the Scouring of the Shire, only coming forward at the end to confront Saruman directly. When the old wizard was dead and his Ruffians run off, Frodo quietly settled down at Bag End, acting as the Deputy Mayor of the Shire until Wil Whitfoot could get back to health.. But the ordeal of the Quest had done irreparable damage to his spirit and vigor, and the loss of the Ring continued to haunt him. Each March at the anniversary of the Ring�s destruction he would become ill, and in October, the wound dealt to him at Weathertop by the Lord of the Nazg�l would cause him great pain. In the place of the Ring, on a golden chain around his neck, he wore a white gem which he would often clutch at in his dreams. Finally, late in 1421 Frodo could bear it no longer. He rode to the Grey Havens, joining many of his old friends including Bilbo, Gandalf, Elrond and Galadriel. They boarded a white ship and passed in it beyond the confines of the world to dwell for a while among the deathless of Aman. REF:[I]-21, 41, 44, 51, 63, 74, 90, 95, 123, 170,184, 187, 200, 240, 243. 260; [II]-280, 324, 332, 340, 443, 467, 470, 471, 478, 479; [IV]401, 413; [VI]206, 207, 208, 209, 210, 211, 226, 248, 249, 255, 259, 295, 337, 340:347	 What's New? ?